Spring has sprung and that is critter season in the desert southwest. Some of the desert denizens are an irritant for homeowners. Others pose a series threat. Officially there are 466 different type of insects in Arizona, but this doesn’t include imports such as Africanized bees. Crickets are among the most common insects that plague homeowners. Nor a danger or threat to the resident or the residence that can be quite annoying, especially when residing in a wall and chirping at the most in opportune times. There is, however, a more pressing reason for putting the professionals at Baron Services to work to make your home cricket free and that is the fact these little fellows are a major food source for scorpions. There are a variety of scorpions but the most common type in our area is the bark scorpion. Unfortunately it also the one with the worst sting that results in a sharp pain with numbness, tingling and possible vomiting. Their light brown color can make them hard to spot but here is a fun little tidbit, they glow under a black light. Aside from poisonous snakes, Africanized bees are responsible for the most deaths. If you encounter one or a swarm, leave the area immediately, and call experts such as Baron Services. If you accidentally disrupt a hive, cover your head to the best of your ability and run for shelter. It is imperative not to flail your arms. And if you think of a swimming pool as a safe retreat, think again. These bees have been known to wait for hours for people to leave the water. Mosquitoes, especially in the Colorado River Valley can be a nuisance. However, in recent years with the spread of West Nile disease which kills roughly 800 Americans every year they are also a health threat. The breeding cycle in the southwest is longer than in the Midwest resultant of mild winters. And as we have had a somewhat wet winter, chances are theses critters will be more bothersome this year. They are not commonly found in the area but ticks are another surprise that people may not expect to find in the desert. Spiders of all types are a tad bit creepy but most will only induce an involuntary shiver. However, there are a couple of spiders that cause painful bites and even illness including the black widow and brown recluse. Surprisingly, the spider most often thought of as a threat, largely the result of countless horror movies, is the tarantula. These hairy arachnids are actually relatively harmless. 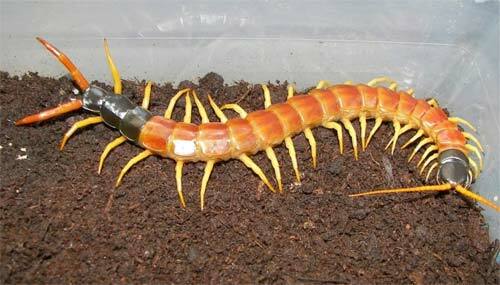 Then there are centipedes of which two varieties inhabit Arizona. These are easily recognized as they are long and flat with numerous body segments, each of which has a pair of legs, hence the name “centipede”. They are venomous. Their sting is seldom life threatening but it will cause severe pain. Most commonly found is the desert centipede but the “Giant Arizona Centipede” which can reach a length of up to 8 inches is not a rarity. It is identified by its size and a reddish color with a blackish head. 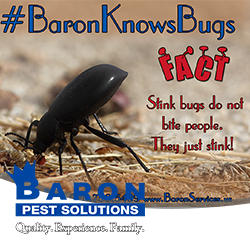 For all pest control needs, Baron Services is here to serve you.